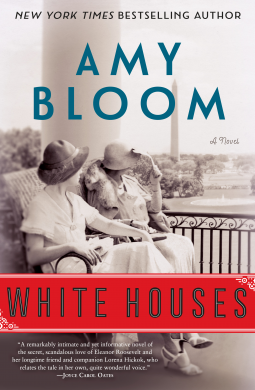 Amy Bloom’s latest novel, White Houses, leads me to a topic that I’ve mentioned before. I think it is important, when writing fiction about real people, to keep their characters true to that of the original person. Historians disagree about whether Eleanor Roosevelt’s warm friendship with Lorena Hickok was a full-blown lesbian affair. Those who believe it was, base their supposition on Eleanor’s exuberant letters. Those who do not, base it on Eleanor’s dislike of being touched. I think that’s significant, and I think people these days misinterpret the tone of letters from earlier times, when friends expressed themselves more affectionately than we do. Amy Bloom has chosen to believe that the women’s relationship was a lesbian affair, and that’s what White Houses is about—and all that it’s about. It is written from the point of view of Lorena Hickok—or Hicky, as she was called. The novel paints a relatively convincing portrait of Eleanor, although I don’t buy the bed bouncing, and it is a sad story and ultimately touching. Its premise, though, makes me uncomfortable for the reasons stated above. Franklin does not appear in a positive light, and in terms of their marriage, he should not. The character study of Hicky as a downright, plain-speaking reporter who gave up her career for love is a good one, and one I can believe. Julia Dunstan is delighted to have inherited her uncle’s Belmont House in Goatstock. Belmont House was the place of her fondest memories of childhood, when she and her cousin Dora would visit there. Dora, too, she is meeting for the first time in years, since Julia’s widowhood and return from life in the colonies. As Julia is given to impulsive and kind acts, she invites Dora to live with her at Belmont House, Dora having had such a hard life. In Goatstock, the neighbors are all agog to set eyes upon Julia. And eccentric neighbors there are aplenty. Mrs. Minnis dresses like a juvenile and borrows from the neighbors; if returned, the objects are broken. Mrs. Prentice is so embarrassed at being caught looking into the house from the street that she fails to call. The vicar and Miss Pope are being preyed upon by Miss Briggs, who sees Alaric Pope as a future husband. Lady Fincy is the expert on food and gives lectures about eating nettles. Of young people, there are only three. Julia has brought along her nephew, Robert, just qualified as an engineer. Marian Prentice is engaged to a missionary in Africa, and her best friend, Harriet Finch, would like to see her stay in England. Harriet plots to throw Robert and Marian together before she realizes she quite likes Robert herself. As for Julia, her kind heart soon has her feeling responsible for several people. But she eagerly renews her friendship with her cousin, Francis Heswald. He always did like her, she thinks, but maybe he likes Dora a little more. I’ve found all of Elizabeth Fair’s books delightful, and this one is no exception. They have been compared to the work of Angela Thirkell, minus the sentiment. I don’t actually think of Thirkell’s novels as sentimental, however, so I’m not sure what that comment means. With Fair’s flair for eccentric characters and their lightness, her books remind me more of some of those of Elizabeth Cadell. Although Mr. Heritage has been friends with sisters Rose Barlow and Edith Newby for years, he is jealous of the attention of his godson, Edward Wray. So, he is not at all happy when he notices that Edward is attracted to Rose’s daughter Lucy. Lucy has been friends with Nevil Fowler since they were children and has a dim expectation that they will eventually marry. That’s why it takes her a while to figure out that she has feelings for Edward. In the meantime, Mr. Heritage’s machinations have put matrimony in Nevil’s mind, and Lucy’s best friend, Philippa, has intimated that she is closer to Edward than she actually is. Seaview House is another charming domestic comedy from Elizabeth Fair. I only recently discovered her novels, being republished by Furrowed Middlebrow, and wish there were more than six of them to read. A broken engagement followed by a bout of pneumonia brings Hester Clifford to Mingham and her godmother, Cecily Hutton, for recovery. She is inclined to think the Huttons need some organizing. Cecily is a woman of two moods, the creative and the motherly, of which the creative is the predominant. So, her household is poorly run. Her husband, Bennet, has been an invalid for so long that invalidism has become more of a habit than a necessity. Maggie works hard on a nearby farm, but Cecily is constantly scolding her for her dress and general messy appearance. Derek can’t decide what to do with his life, so keeps changing jobs. The Huttons used to be friendly with Thomas Seamark, but since his wife’s death four years ago, he has become a bit of a recluse. Hester thinks it’s about time the friendship was renewed, and her efforts are successful. This renewed acquaintance leads Cecily to the conclusion that Hester would make a perfect wife for Thomas. She becomes so convinced of this that she doesn’t even notice she is putting obstacles in the way of his pursuit of her daughter, Maggie. Like Fair’s other novels, The Mingham Air is full of colorful village characters, like Mrs. Hyde-Ridley who competes with her closest friend to entertain her while spending the least possible money, and Mrs. Merlin, the rector’s wife, who co-ops the parish féte for a display of country dancing. I enjoy these light novels, which contain just the slightest edge. Someone once remarked to me that the Angela Thirkell novels set before or during World War II are the best, and so it seems to me, reading this one. Pomfret Towers is set before the war. Timid young Alice Barton is terrified when she learns she must accept an invitation for a weekend at Pomfret Towers along with her brother, Guy. Lady Pomfret is home on one of her infrequent visits from Italy, and Lord Pomfret wants some young people around to entertain her. But she needn’t have worried: almost everyone is kind to Alice. Phoebe Rivers, a cousin of the family, has made sure Alice’s room is next to hers and helps her pick out her outfits for dinner. Alice’s good friends, Roddy and Sally Wicklow, are there, Roddy being the junior estate manager. Gillie Foster, Lord Pomfret’s heir, is extremely kind and fetches her shoes for her from the servants. Even Lord Pomfret, who is known for his rudeness, is kind. One figure who continues to be terrifying is Mrs. Rivers, a best-selling author. Although Alice’s mother is also an author (a better one, we suspect), she is modest about it, unlike Mrs. Rivers, who constantly talks about herself and tries to arrange things for everyone, as if she were the hostess. Another egoist is Julian Rivers, but Alice only sees how handsome he is and how wonderful he seems to be. His behavior is sometimes unusual, but he is an artist. One of the things Mrs. Rivers is trying to manage is a marriage between her daughter Phoebe and Gillie Foster, but Gillie seems to prefer talking to Alice or working in the office with Sally. And Phoebe keeps running off with Guy to look at buildings he and his father are restoring. Pomfret Towers is another romance by Angela Thirkell, full of delightful characters and slightly winking at society. 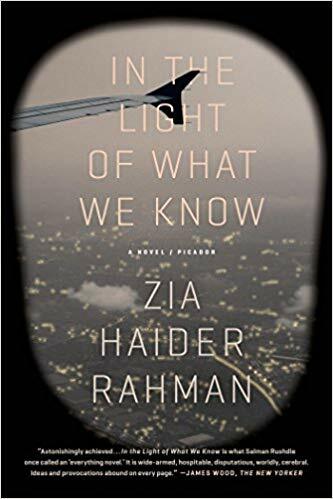 This novel is one I particularly enjoyed. Alice is a little silly, but she is young and lovable, and we are sure everything will come out all right. I was so enchanted by History of the Rain that after finishing it, I soon looked for other novels by Niall Williams. Four Letters of Love is his first. Nicholas Coughlin is a boy when his father abandons his career as a civil servant to paint, saying that God wants him to. For two summers, he leaves Nicholas and his mother home alone while he goes out to paint. The rest of the year, he obsessively reworks the paintings he did in the summer. Then Nicholas’s mother dies, but stays to haunt the house. His father intends to go out as usual and leave Nicholas home alone for a few weeks, but Nicholas follows him. His efforts all along are to try to capture some of the attention of this obsessed, abstracted man. Isabel Gore is the daughter of a schoolmaster on an island off the coast of Galway. Her brother Sean is a gifted musician, but one day after playing for hours while she dances, he has a fit and after that is mute and wheelchair bound. Isabel blames herself for Sean’s condition. The Master sets all his ambitions on Isabel’s academic career and sends her to Galway to a convent school. But Isabel has a streak of wildness in her and sometimes walks off from school. On one such expedition as a teenage girl, she meets Peader O’Luing. He is a poor excuse for a man, but she doesn’t see that and falls in love. The novel makes no secret that it is moving toward the meeting of Nicholas and Isabel. To get there, it tells their stories with some whimsy, some pathos, and a touch of magical realism. Although the writing style and voice are not as distinctive as that of History of the Rain, the novel is still beautifully written. I enjoyed it very much.